Looking for private in-home or in-studio Trombone lessons? Our College Point teachers are ready to get you started. Find your teacher today! One of the most enjoyable instruments to play when done correctly. As a younger brother at the age of five, I began studying the piano because my older sister did. After my foundation in music strengthened I fell in love with the trumpet. At first, each note took time to develop and I enjoyed the challenge. The trumpet allowed me to travel all over the Southeast later in life and even to China with a 1940's Radio Show. I enjoyed many top-level bands the kindled my love and passion for good music. I want to share that kindling with my students in a nurturing and guiding situation, just like my teachers gave me. and Radio City Music Hall, 54 Below, The Jazz Standard, Bowery Ballroom, Shapeshifter and Flushing Town Hall in New York, my fire for wanting to develop my teaching did also. I was always thinking back to what my old teachers gave me, inspiration. I then understood that inspiration is the key to success in life. Lessons will be something the student looks forward to every week. We will work through common method books and learn material that the student has an interest in. For example, some students want to learn to play high notes, a popular song, improvise, or write their own songs. I am a laid back guy, but I do expect effort in the lessons and at home. I believe whatever you put into music is what you get out of it, and I will inspire and motivate the student to get as much out of the lessons as they can. Students will create, with my advisement, and update short term and long term goals every few months. They should provide their instrument, instrument care products (valve oil), method books and sheet music. I specialize in jazz and classical music. I use many common methods depending on how the student tends to learn the best, and will even combine different methods if the student requires it. A great knowledgeable teacher; he conducts his lessons pleasantly and efficiently. I have had several lessons so far with Gregory and as an experienced trumpet player can recommend him extremely highly. I am getting back into the trumpet following a gap after playing for 10 years when I was at high school. Gregory has really helped getting my technique and sound going again, I have been really pleased with my improvement. He has a great demeanour and has been great fun to work with. He is also an excellent player, and is highly reliable and easy to schedule with. Greg is supportive, patient and has a great understanding of how to approach the student to make the lesson interesting. One the most difficult to wrangle, when you can find a partnership with a trombone... it is a magic. Much loved, rarely tamed, a true joy to play. This is my main instrument, and one of the most hilariously interesting human inventions. I love talking about it. I am a professional full time Trombonist. At the same time, teaching has always been a big part of who I am - I love teaching. My music career has taken me around the world and back but more than that it has given me a wonderful tool of self expression, and for that I am forever grateful. My band performs regularly in Opera houses as well as coffee houses... Other than the Trombone I do play the Trumpet as well, and I have over 8 years of Piano under my belt. I am a graduate of New York University's brass program where I studied with renowned trombonist Per Brevig. I am an active member of the Manhattan freelance community. I have performed at Symphony Space, Verizon Hall of the Kimmel Center in Philadelphia, The Bowery Electric, The Hudson Music Festival, Carnegie Hall, and many more. 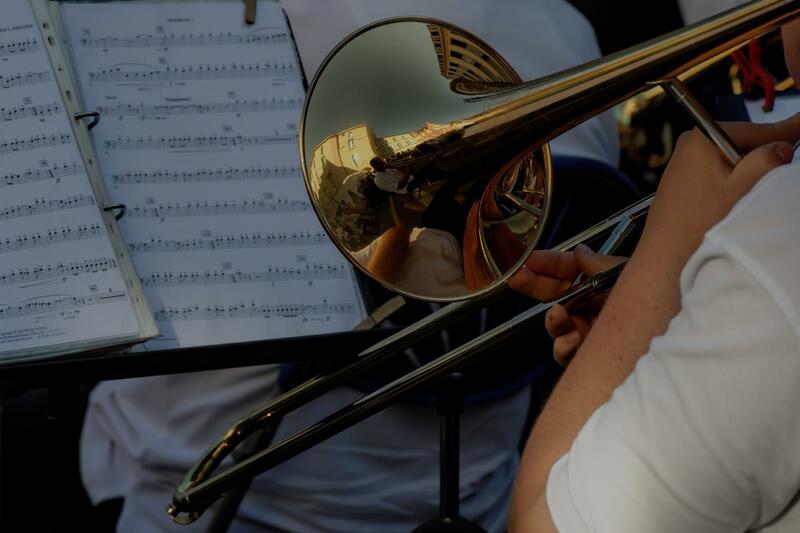 Students can expect a fun and challenging educational program that focuses on improving core trombone technique and most importantly, overall musicianship. Hi there! I am a classically trained, professional trombone player, ukulele player and songwriter working in New York City. I've been helping my students achieve their musical goals for 2 years! It's important to me that my students have a strong technical foundation that allows them to have fun and make beautiful music. From my lessons, you can expect to grow your skills as an overall musician, as well as in your specific lesson subject. Musicians make well rounded human beings and I love being a part of that process! Contact me today! Ms. Elizabeth is very nice, professional, and kind. She effectively teaches techniques, improves skills, and solves problems. I like to study trombone with her. Thank you very much! First lesson today went very well— my son (12) is excited to continue! Looking forward to hopefully many more! Thanks, Elizabeth, for being very responsive and prepared. My daughter was so excited to play the Ukulele after her first lesson. She has already completed her practice sheet 5 Times. If you are looking to take your tombone playing to the next level, you came to the right place. I am currently a trombone major at the New School for Jazz and Contemporary Music and have studied with some of the best trombonists in New York. I have a lot of playing and teaching experience, having performed at venues such as Carnegie Hall, Jazz at Lincoln Center, and many other venues around the city. I can teach you any style you are interested in and will make sure you have fun doing it. I am a professional trombonist/guitarist living in New York City. I recently finished my Bachelor's Degree in Music Performance at the New School For Jazz and Contemporary Music. I have a lot of performing, touring, and teaching experience, performing in venues such as Carnegie Hall (Stern Auditorium and Zankel Hall), Dizzy's Club Coca Cola at Jazz at Lincoln Center, The Jazz Standard, Smoke Jazz Club, and many other venues around the city. I have several guitar and trombone students, but include music theory, composition techniques, and ear training into my lessons as well. I have experience in a variety of different styles of music. I really enjoy sharing my love for music with my students, and my main priority is making sure that my students' learning experiences are as efficient and enjoyable as possible. Billy is a great teacher, he knows his stuff and teaches really well. He helped me get through an audition for my school Jazz band and I'm learning so much from him. Professional jazz trombonist with 5 years of teaching experience! Especially experienced in teaching beginners. Proficient in teaching all styles of music to all ages and levels. Lessons are customized and catered to the needs/goals of each student. Instead of simply training students to read music and play notes, I prefer to teach my students to think, play, and act like musicians. My lessons feature improvisation skills, sight-reading, playing by ear, building a strong technical foundation and music analysis. I assure you will see leaps of improvement by working with me! I'm a professional trombonist with a strong musical background: I have a Bachelor of Fine Arts in Music Performance - Trombone from City College of New York and Michigan State University. I have 7 years of experience teaching students of all ages and levels, and I have been working as a freelancer since I was 17. I originally arrived in NYC from Argentina at 9-years old. The rich musical environment of NYC allowed me to study and absorb all styles of music at a young age. I have had the opportunities to study with trombone masters such as Michael Dease, Jason Jackson and Wycliffe Gordon. These learning experiences directly affect the development of my students. Reggea, Ska, Rock, Pop etc. As my student, you will develop critical skills that will help build a strong musical foundation which will define you as a musician. I will evaluate the level in which you currently are and provide a clear defined path in order to reach our goals. One thing I strongly focus on is your love for music. My goal is not only to see you progress, but to love the music and have fun with what you are playing. I can't wait to work with you and help you reach your ultimate goals! Enjoy improving my skills and experimentation on the trombone, now in my second year of classes with Alejandro Espinosa. He makes the sessions fun and challenging at the same time. I've improved enormously, yet realize of course how far I've got to go. Lucky to have such a fine teacher guiding my progress. Awesome teacher and instructor. Very patient and knowledgeable. Hello! Through my four years at the Juilliard School I have taken lessons with some of the worlds most prominent trombonists, including Elliot Mason, Steve Turre and Joe Alessi. In addition, I have a vast experience of teaching both classical and jazz students. I've created my own general lesson plan comprised of exercises I have received from these world renown teachers, as well as from other working professionals in NY. I'm very quick to notice your skill level and create a cohesive, unique lesson plan catered to working on your weaknesses and polishing your strengths! A mediocre teacher will simply give you default exercises to work on-- a task better left to google. A good teacher, however, can diagnose a student and find the most efficient way for he/she to improve. I promise to be a caring, fun, informative teacher. Please contact me for more information about my lessons. Teaching is my biggest passion, I can't wait to work with you! Hello! I'm Sam and I'm a graduate of the Juilliard School. I'm a huge music nerd and teaching is one of my biggest passions. For eight years, I have been teaching students of various ages and backgrounds, compiling lesson plans designed to work with students at ALL LEVELS. As a prominent NYC based jazz trombonist/bandleader/composer, I am more than qualified to teach any student. If you have any questions about my specific lesson plans for a particular subject, please don't be afraid to shoot me an email! my first lesson went very well. Awesome teacher. My skype lesson with Sam was one of the most insightful musical experiences I've had in regards to educating myself about the craft of trombone playing. Not only is his remarkable prowess at the instrument itself apparent but his knowledge of musical harmony and overall artistry allows all of his expert advice to come full circle and become even more impactful. His teaching style was incredibly supportive and effective and with clear and concise input I feel like I can very easily implement the information he gave me into my own playing. From the nuances of trombone technique to the intricacies of complex musical harmonies and progressions, Sam is more than capable of instructing students of all ages and skill levels. I would absolutely recommend Sam to anybody who wants to study music/trombone seriously or even is just getting started and wants to build a strong foundation. I can't wait until my next online lesson! Professional trombonist for over 10 years. A Master’s degree in Trombone Performance and 10 years of teaching experience. In my opinion, the trombone can be one of the most beautiful and simultaneously one of the most aggressive instruments in the brass family. It is my favorite solo instrument to listen to. In teaching trombone, my goal is to develop an intelligent, independent musician with a firm grasp of brass and trombone fundamentals. I also want to help students learn to practice smarter, not harder. I have been studying and performing on low brass instruments since the 7th grade, ten years ago. Since then I have picked up multiple different instruments (tuba, bass trombone, tenor trombone, and euphonium/baritone), performed professionally across the tri-state area, and have played over 100 concerts during my college career. I started teaching in my senior year of high school when I interned at my district's middle school music program, and have continued to teach privately since then. I am a very experienced performer and plan to enter a Masters program in tuba performance this fall. Please message me with any questions, and I hope to get to work with you soon! Students are raving about their Trombone instructors on TakeLessons. Check out some of these recent reviews. "Alejandro Espinosa is a natural-born teacher. I look forward to my weekly classes. Been a student now for 7 months. - Michael"
New York, NY teacher: Alejandro E.
"Bobby was very patient and encouraging. Can't wait for our next session!" "Excellent with my 12-year old child, on-time, stays longer to finish lesson. Great communication skills, well rounded." New York, NY teacher: Billy D.
h her. Thank you very much!" New York, NY teacher: Elizabeth P.
the right techniques to get good and it shows in his playing. Overall great teacher and a great guy, really cares about the growth of the student." New York, NY teacher: Abdulrahman A.
e been studying with him for two months now. Both of us have been impressed with my progress on the instrument." ding notes, learning a little bit about music theory (keys etc) and of course playing. I wanted to practice with some songs I like and Billy was able to write the notes down for me. This was super helpful and really made me enjoy playing the trombone again! We practiced in a room in the New School, which was cool since I could play as loud as I wanted, compared to back at home where I usually use a mute. He was very patient and friendly and I can highly recommend him as a teacher."